Bilbao wasn’t always the cool cultural and culinary city that it is today. Situated in north-central Spain, the largest city in the Basque Country experienced heavy industrialisation throughout the 19th century and early part of the 20th century. Tourism was virtually non-existent. 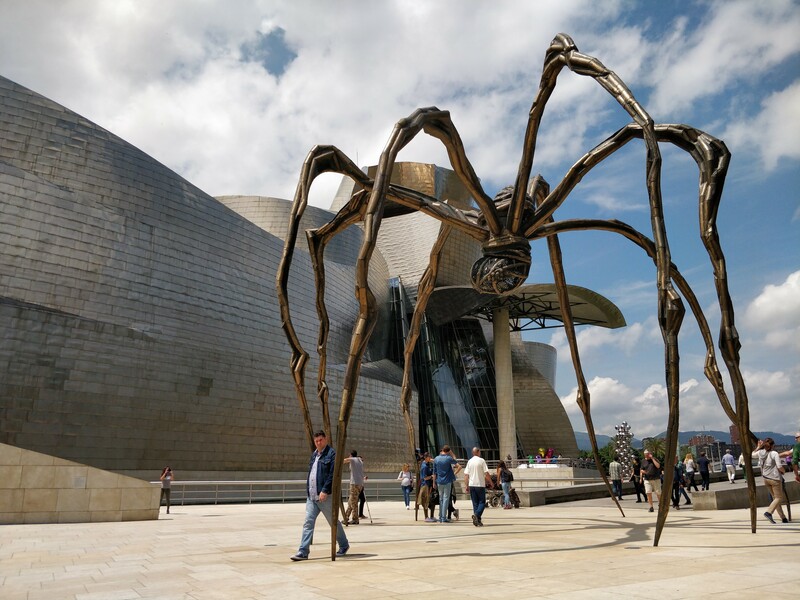 However, Bilbao turned things around by investing heavily in culture after its steel and shipbuilding industries collapsed. The striking Frank Gehry-designed Guggenheim, which opened in October 1997, pays homage to this industrial history and kickstarted the city’s renaissance. The Old Town (Casco Viejo) was transformed and is now home to boutique shops and pintxos bars (the Basque equivalent to tapas). 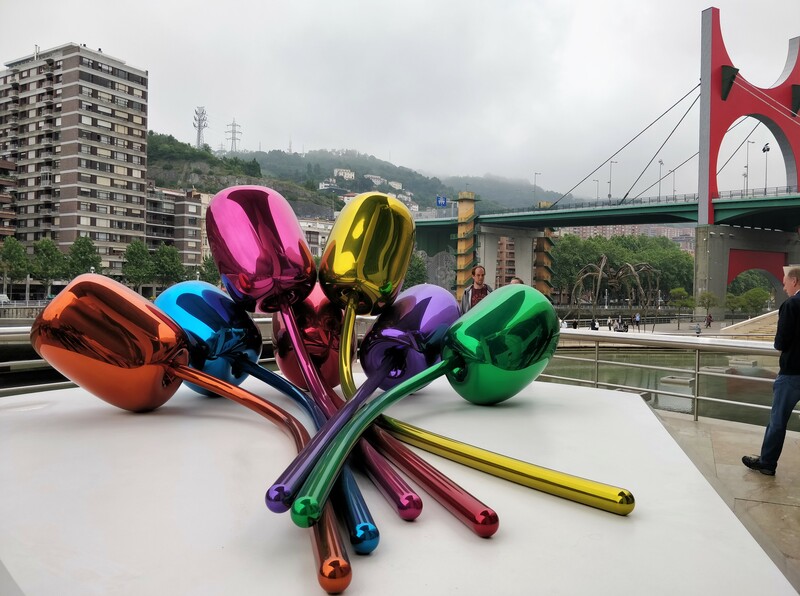 Bilbao’s profile continues to soar in 2018, having been named European City of the Year and hosting The World’s 50 Best Restaurant Awards. Now, while modern architecture floats my boat, my ultimate focus is always food. Let’s be honest, this is why you’re here, too. You’re probably reading this on your commute, during a break or before bed (naughty; this should daily digital detox time, but I’ll allow it since it’s my article keeping you up), so time is short. As such, onto the meat of the matter: The best pintxos bars Bilbao has to offer. Basque cuisine heavily favours meat and fish and so vegetarians/vegans may struggle to get their fill. That said, tortillas, tomato salads, mushrooms, patatas bravas, local cheese, pan con tomate and Padron peppers are abundant, meaning you won’t go hungry. However, given that neither Chef Savla or I fall into this category, my top picks therefore feature traditional ingredients. For wine, I recommend trying Txakoli (local sparking white wine; pronounced ‘cha-ko-li’). Menus naturally have a very Spanish bias, so alternatives include Albariño, Moscato, Rioja, Rueda and Cava to name a few. 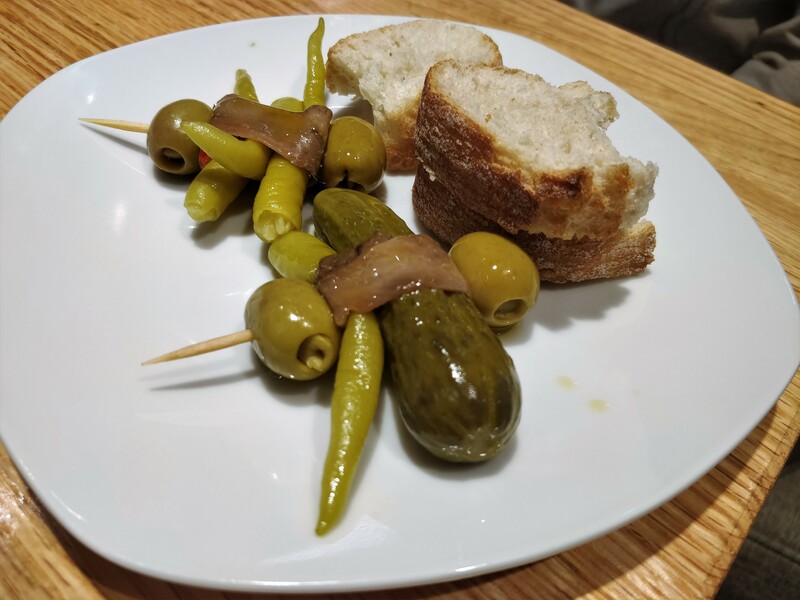 Cold pintxos (pintxos fríos) are available on the bar (always ask the staff for a plate; don’t help yourself) while hot pintxos (pintxos calientes) need to be ordered. You can order as little or as much as you want, in one go or separately, then pay at the end. Most bars accept credit/debit cards, but be prepared to pay in cash just in case. During peak times, pintxos bars are busy, cramped and loud. If you fancy a romantic meal, I advise looking at other options. Most locals speak English to varying degrees, but they’ll all appreciate any efforts to communicate in Spanish. It may be tucked away in the corner of Plaza Nueva, but there’s no missing Café Bar Bilbao’s bright blue façade. When you walk in, you’ll be greeted by plates of pintxos lining the Belle Epoque-style bar. Along with the expected croquetas, tortilla slices and bacalao pil-pil (traditional Basque Country dish of salt cod, olive oil and garlic), this place will surprise you with its quirky creations; think plum-sized cheese lollipops dipped in red fruit coulis. 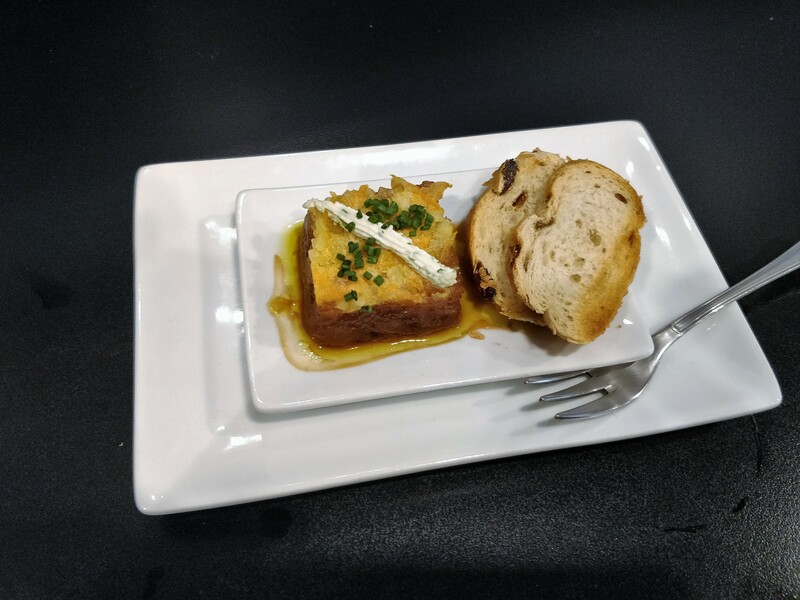 Of everything we tried, the standout pintxos were jamón and Padron peppers on fresh tomato puree-coated bread, smoked salmon draped over crab meat and a fishcake topped with fried calamari. Ingredients taste bolder in the Basque Country. If, like me, you’re crazy about tartare, make sure that your plans include Bar Gatz. We arrived too late in the afternoon to try their steak tartare (I’m still cursing myself about this), but I can confirm that the tuna version is delicious. There’s a double dose of texture, as the tuna square is topped with a layer of crisps and then served with tiny toasts. Also, don’t dismiss the sandwiches: ham, cheese, anchovy paste with a hint of paprika have never tasted so good together. Pair your pintxos with Txakoli, which, at €2 per glass on average, is a minuscule drop in the holiday budget ocean. Or Cava, which may be double the price, but is still very reasonable. Researching where you want to eat before you travel is advisable, although winging it never hurt anyone. Which is how we came to gorge on platters of morcilla (black blood sausage) and croquetas at neighbourhood bar Artxanda. If the mention of black pudding and blood sausages repulses you, that’s probably because you’ve never tasted the Spanish version. It’s usually made with rice and onions, making it slightly nutty and sweet. Different spices are used in different regions, so you can detect hints of paprika, cloves and aniseed sometimes. 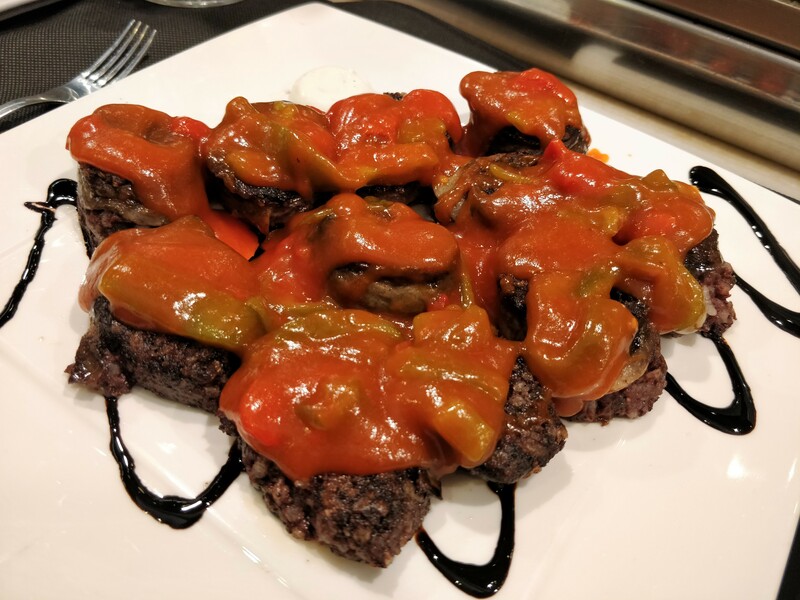 At Artxanda, the morcilla discs are drizzled with a mellow tomato sauce with green peppers. As for the croquetas, we had a mix of top-quality, straight-out-of-the-fryer seafood, meat and mushroom ones. You’ll obviously need wine to accompany both. Another discovery en route to somewhere else, this is the epitome of a local pintxos bar: a long and narrow space, a food-filled counter and simple décor. We were seduced by the smoked ingredients on offer, particularly the bonito, sardine and cheese. 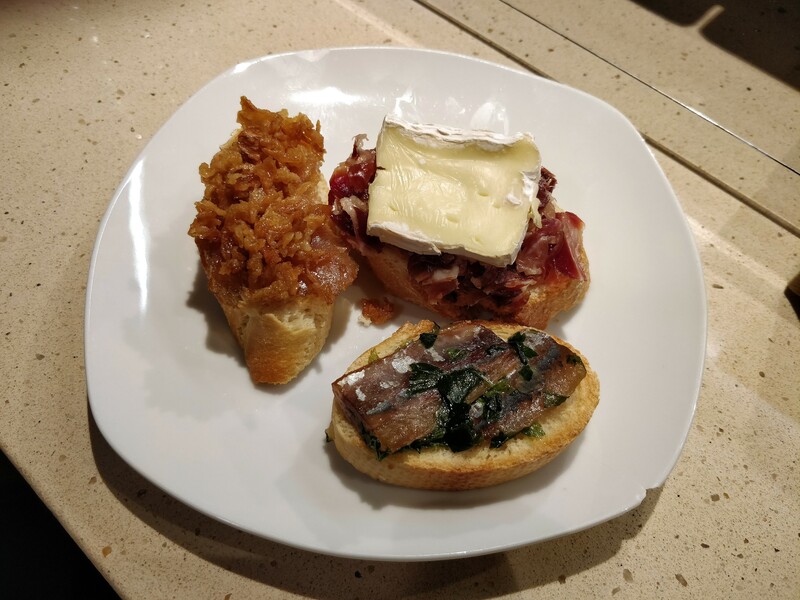 Brie with jamón and tomato marmalade, melted Manchego with garlic sauce, smoked salmon with pickled peppers and sunblush tomoatoes with goat’s cheese were so scrumptious that we almost made a meal of Gaztandegi’s pintxos menu. La Viña is widely referred to as one of Bilbao’s best bars and I’m inclined to agree. Established in 1927 and run by the third generation of the same family, they know a thing or two about serving perfect pintxos. Admire the wood-panelled walls decorated with letters from adoring fans while you savour silky acorn-fed Iberian jamón on pan con tomate with a spicy mayo, tortillas that spill their golden liquid centre when you cut into them and the smoothest potato puree to accompany foie gras and sautéed mushrooms. If you don’t want to stand and eat at the bar under the hanging jamóns, you can always reserve one of their tables, which remain unchanged for the past 60 years. Being opposite La Viña makes it very easy to squeeze in a few more pintxos here. As it’s much smaller in comparison, the atmosphere is slightly calmer, but the idea is the same: pick something from the bar or order off the blackboard and grab a drink while you’re at it. We stuck to seafood, with the highlights being creamy crab meat gratin on toast and Asian-inspired mini tuna steak. If bar hopping isn’t for you, food markets are the perfect way of exploring the local cuisine under one roof. We ordered a glass of sangria then worked the room: warm, fatty and crispy pork crackling, meat croquetas with Padron peppers, foie gras and jamón croquetas and a selection of gildas, another Basque speciality of olives, salted anchovies and chilli pickled peppers on a cocktail stick. The ideal savoury snack, which, after avoiding on my first trip to San Sebastián last year, I enjoyed at almost every bar we visited. Funny how our preferences change over time. We stayed at the five-star Gran Hotel Domine; the epitome of Spanish style, luxury and elegance. Being located opposite the Guggenheim means that you can add convenient to the list of benefits as well. The entire complex was renovated in 2017 and now boasts on-site restaurant Beltz, café and bar, multiple conference rooms and a new Wellness Centre. Although we did take our gym gear, we left it in the suitcase and booked a couple of massages instead. The menu states that the Californian is strong; I concur. Over 90 minutes, the masseuse took great pleasure in working out the knots in my upper back, which may not have been relaxing, but was certainly effective. We decided against having breakfast at the hotel in favour of local cafes, but did head to the rooftop terrace bar overlooking the Guggenheim. Sadly, the weather wasn’t behaving that day, so back down we went to try the Sixty-One Lobby Bar. G&T in hand, we admired the marble surfaces flanked by cream leather sofas, ceiling-to-floor mirrors, soft teal-coloured booths and modern artwork. 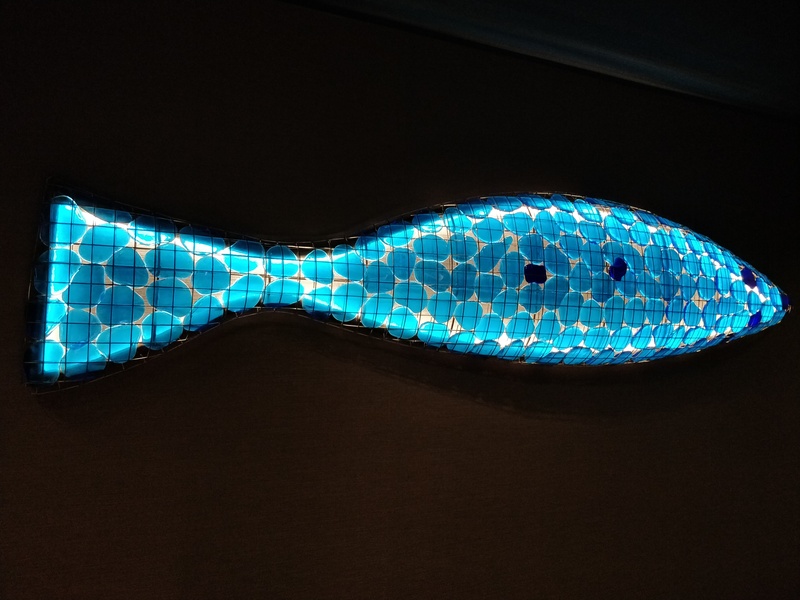 The hotel commissioned numerous canvases and sculptures from Spanish artist Javier Mariscal which can be found on every floor. 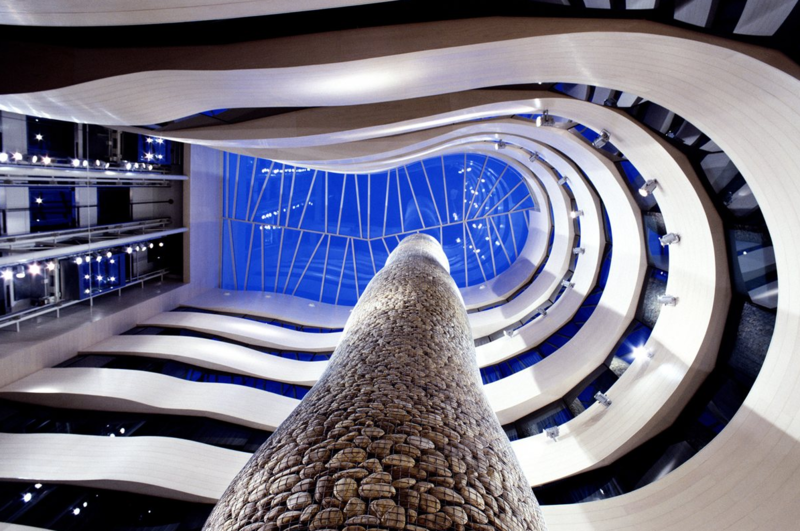 His use of bold lines, colours and forms gives the hotel a sense of individuality. As much as I appreciated them, my favourite piece was the clock in the reception. At first glance, it looks like a bunch of clock hands moving at random, but the actual time is revealed at the end of the sequence. It’s especially spellbinding after a few drinks. Another remarkable feature is ‘Cypress Fossil’, Mariscal’s 80-foot wire mesh pillar filled with sea-worn rocks in the atrium. The lifts all look out onto it, so you can appreciate it from bottom to top as you make your way to your room. Speaking of the rooms, ours was spacious, with a comfortable bed and large bathroom. The latter was fully stocked with The White Company products, and the pillow spray was a particularly nice touch. When we had a minor issue with the safe, a member of staff came within minutes to assist us. If you’re hungry for more and can’t wait until I share my review of lunch at Michelin-starred Nerua in the Guggenheim, you can read about my top 10 pintxos bars in San Sebastián (link below). 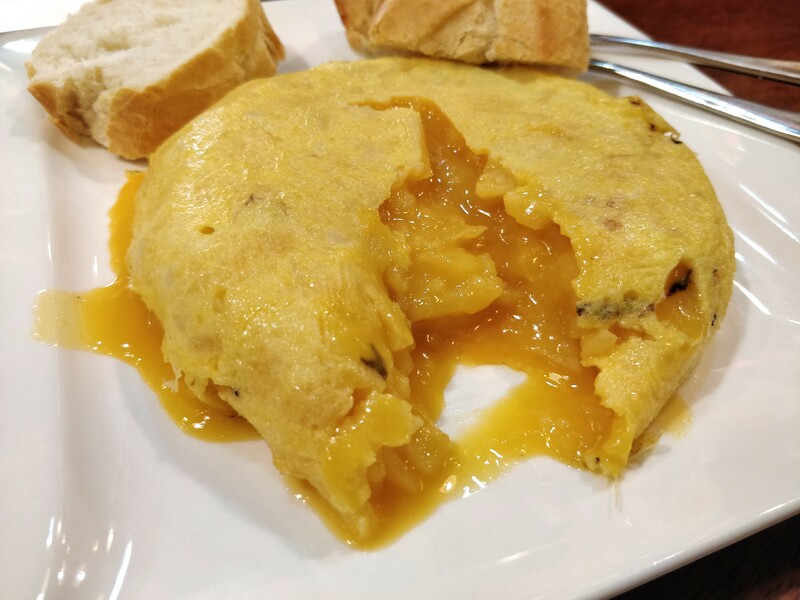 While the latter has a solid reputation for gastronomic excellence, I heartily recommend visiting Bilbao as well if time allows as they’re quite different. In my experience, there were fewer tourists, the food represents better value for money and the cultural scene is booming. 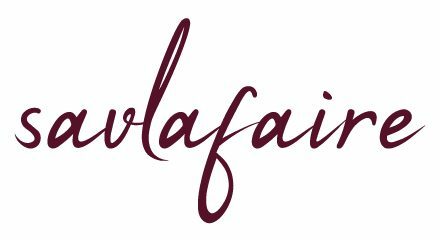 All words, images and costs incurred are my own, unless otherwise stated, and remain the trademark of SavlaFaire. I’m not so familiar with Pintxos as I’m pescatarian and like you agree a lot contain meat but have enjoyed the veggie options! You have described them well and I love your snippets of info about Bibao. A place I’ve never visited but have on my never ending list! I think you’ll be fine with the fish and veggie options out there! 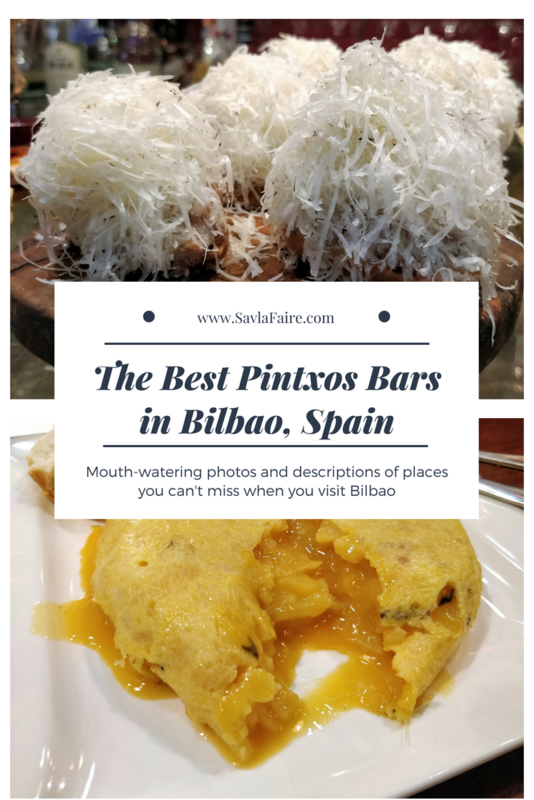 Glad I’ve given you a taste for pintxos, and happy to advise more when (and not if!) 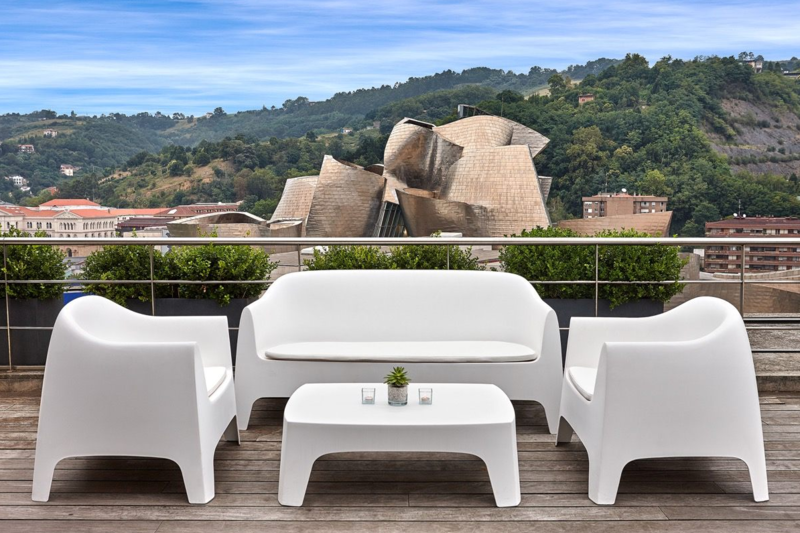 you book your trip 🙂 Bilbao is a stunning city and there’s so much to see, eat, drink and do. The visit to Bilbao and San Sebastian is not worth it: it always rains, even in August; the people are distrustful and cold. And the pintxos seem like a scam: they are expensive and they have nothing you can not do at home with little effort.